For future reference the Wikitravel:CIA World Factbook 2002 import can be found at Talk:Panama/CIA World Factbook 2002 import. I think Panama is one of the greatest yet undiscovered destinations to visit. I live here and have a lot of nice pictures I wouldn't mind sharing as long as credit is given or I can leave a small mark in each picture. Could I create some kind of mini picture gallery? I just discovered this site, and live in Boquete, Panama. I am starting to add things to do and see as I have time; with links to web sites, for more information. There is a lot to do in Panama City, but actually the real adventures are out of town. If someone is coming to Panama I would recommend a couple of days in the city, then Boquete, Bocas del Toro, San Blas, etc... It is easy to travel to different locations and the mico-climates change drastically. As a former resident of Panama, and sad that I had to go, I want to add a few things to do, for people that want to have an idea... If your interest is beaches, water sports, and things like that... I recommend visiting Bocas del Toro, Contadora, the Pearl Islands (Survivor was filmed here), Isla Grande. It's in the Caribbean side of the country, beautiful beaches, nice accomodations, and great experience. If you are into resorts to go to and wake up go to the beach, swin in the pool, and lounge, then Playa Blanca, Decameron and the new resort being built Nikki Beach. For adventure... There are many rainforest, and excursions, the province of Darien, Bocas del Toro, Gamboa Rainforest. El Valle and Cerro Punta. Cultural experience. You can visit the indigeneous islands of the Kuna indians. San Blas. They have beautiful beaches, excursions, and you get to experience how the indigeneous people live. Portobelo (which is also the sitte of the religious celebration of the Black Christ in October). You can also visit an inactive volcano, in the province of Chiriqui, and the city of Boquete is also very popular. 2 good times to visit the country are Carnaval (Mardi Gras) and beginning of November during the National Holidays, there are a lot of parties all around the country. The province of Azuero is a well known spot during these holidays. Sights in the City. There are several casinos, shopping malls, and exciting night life. There is no beach near the city, even though you are looking at the sea. Cultural and historic sites like Panama Viejo (the ruins), Casco Viejo (Old Town), Amador Causeway (shops, places to eat, walk, cafes), the Panama Canal of course. Dinner at Las Tinajas and breakfast at El Trapiche are almost required for typical food, and if you're into desserts, visit Manolo's Churros, for some good, fresh, hot churros. Experience dim sum (chinese breakfast) at Palacio Lung Fung. Talk ... Spanish dialect: i'm not sure it is necessary to stress in this way the really minor differences between the spoken spanish in latin american countries. The differences are mostly in accent and a few slangs, if you learned spanish somewhere you will be understood in every country that speaks spanish, including panama. I just don't think it's relevant: if you travel to Boston making a stop in Dallas, you don't really need advise about the different dialects of english that you will encounter. Eat: i may be nitpicking but ... culantro tastes nothing like cilantro! at all. And you can most definitely NOT sum up panamenian cuisine in that word. Actually, i would like to rewrite this section. Drink: Again minor: it's misleading to describe Seco as a very raw rum (which it might be, i dont know). Seco smells different and you drink it differently, too (think vodka). Right now in Panama seco with cranberries juice is a big favorite. Stay Safe: it's important to stress that, right now, Panama city is not a safe place (it was, but not anymore). There are more dangerous countries, for sure, but you shouldnt walk around as a tourist thinking that you are in a safe environment. Please, dont go to Colon (the city) unless you know what you are doing or you go with someone who does. Chiriqui and Bocas Del Toro. Veragua, Los Santos and Herrera. The Canal: 5 linked cities (Panama City, Colon, Gamboa, Balboa, Cristobal), 4 ODs (El Valle (though not directly on the Canal, this one is close enough, and we shouldn't be making West overflow with cities and ODs), Contadora (though closer to the coastline of the Eastern Panama, it seems the only way to get there is to take planes from Panama City, so it's best listed here), Pearl Islands (same with Contadora; this is the archipelago Contadora belongs), Taboga (another island with the sole access from Panama City)). West: 9 linked cities (David, Boquete, Boca Chica, Pedasi, Cerro Punta, Rio Sereno (the last two are "hidden" in Chiriqui article), Bocas del Toro, Changuinola, Almirante (and these three are "hidden" in Bocas del Toro)), 7 ODs (Bastimentos, Gulf of Chiriquí, Boca Chica, Parque Nacional Marino Golfo de Chiriquí, Coiba National Marine Park, Volcan Barú, La Amistad International Park (a number of which have breadcrumbs showing that they are part of the region of Gulf of Chiriquí)). 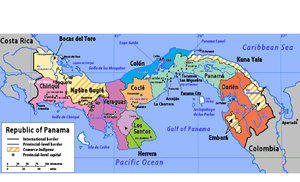 East: no linked cities (though this should be no surprise, given the vast forests and swamplands in Darien Province of easternmost Panama), an OD (San Blas Islands). I'm not sure which side La Amistad NP should go though, and couldn't find which coast it's nearer from a quick Google search. Article of Costa Rica, which has part of the park, gives no clue either. It may best be placed in where its main gateway is located (but no clue about that either). This is almost exactly the division I proposed more than a year ago, except that I've proposed Pearl Islands to be a part of Central Panama, since their only access to the rest of the world seems to be via Panama City. However, having no travel experience in the country, I can readily accept arguments for the contrary. I'm not sure how good and distinguishable "Pacific West" and "Caribbean West" are as region names—I've just proposed them as some sort of "provisional" names to make it clearer what I was talking about, so if anyone has better alternatives in mind, by all means, please go ahead. I haven't checked recently but as far as what my original post above says, Chiriqui, Bocas del Toro, Gulf of Chiriquí seem to be third-level subregions, but we might need a through check again. On the Pearl Islands that's my error - I intended to include those in Central for the very reasons you put forward. They got incorrectly grouped somehow. Will put that right. I am not in love with bland names like Pacific West either and only use them by default. But I couldn't really come up with anything else. This page was last edited on 9 October 2015, at 22:04.